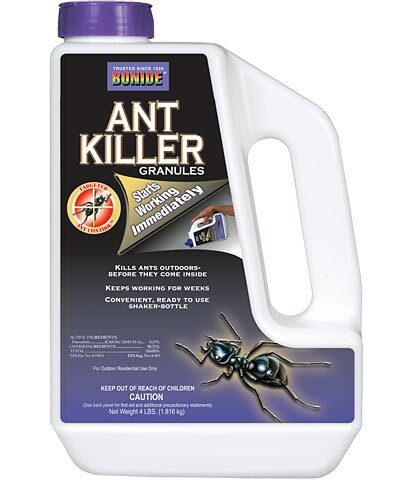 Control outdoor pests around your home with Bonide Ant Killer Granules. Simply apply these granules as directed to your lawn or near the foundation and entry areas of your home to eliminate bothersome insects such as ants, ticks, fleas, mites, roaches, spiders, crickets, silverfish, and Japanese beetles. For outdoor use only, this treatment provides contact and residual control of outdoor insects up to four weeks. Protect your home from annoying insects with Bonide Ant Killer Granules. Coverage: up to 2,000 sq. ft.
Bonide Houseplant Systemic Insect Control Granules, 8 oz. Bonide Systemic Insecticide Granules, 4 lbs. TERRO Ant Killer with Shaker Bag, 3 lbs.